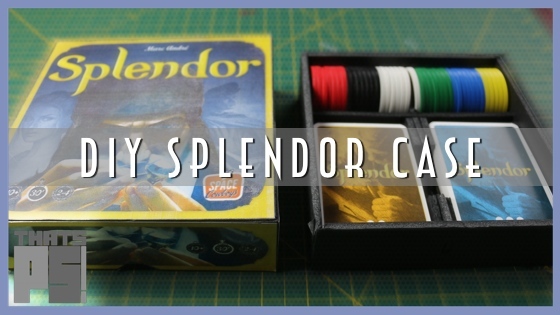 Recently I purchased a copy of the board game Splendor. I’ve played it a few times since, and enjoyed myself every time. I’ve lost every time, but that happens. I’ll get better! What I did notice about the game though, is that while the packaging that does come with it is very well made; Easy to access places for the gem coins; Nice slots for holding the cards; The actual amount of space it uses is pretty excessive. I then decided that I’d come up with my very own DIY Splendor case so that I could fix that. So I sat down with some paper and all the components of the game, and started designing. Eventually I came up with something that fits all the bits, and takes up about a third the amount of space as the original box. It took a couple tweaks t get it to where I was happy with it, but now that I’ve got one, I doubt I’ll ever use the original box again. There are 3 files you’ll need in order to create this. At the minimum, you’ll need the pattern. I’ve also made some stickers for the outside of the box, but feel free to decorate this any way you’d like. I’ve also created a condensed copy of the rules so you’ve got a reference that fits inside the box.